This morning the QSG of NSW presented the replica 'Frederica' coverlet to two representatives of the National Trust of Australia (NSW), Jennifer Palmer (Collections Manager) and David Hoffman (Manager Parramatta Properties), at the Awards Ceremony of the 2012 Sydney Quilt Show. Sandra Lyons spoke about how the group came to make the replica. And in reply Jennifer and David both graciously accepted the coverlet and spoke of the importance of the work to the National Trust. This is a photograph of the replica Frederica, as the coverlet is affectionately known, now on display at the Sydney Quilt Show. Please drop by to view it if you are visiting the Show. This is the quilt label showing sponsors and all those who contributed to its making. The following photos were taken of the sewers who could make it to the ceremony. There were ten dedicated sewers on the raffle quilt in the Guild Office. As you can see from the photographs below, we are making good progress on the raffle coverlet. Please join us for the next Frederica sit and sew afternoon. Because the Guild office is closed due to the Quilt Show in June, we won't meet again until July. We will be at the Drummoyne Community Centre, 10 Cometrowe Street, Drummoyne from 1.30pm to 4pm on Saturday the 7th of July. We are now sewing the hanging sleeve and label on the Frederica replica, which has now been valued by the Guild's quilt valuation team. It will be presented to the National Trust of NSW during the Awards Ceremony on the opening day of the Sydney Quilt Show on Wednesday the 13th of June. We would like to invite all those people who have contributed to the making of the replica to be present. 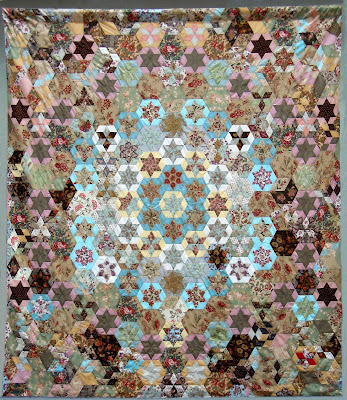 The replica, along with accompanying documentation on its making, will be on show for the duration of the Quilt Show. The original coverlet was made over papers which Frederica Josephson would have hand cut from her hoard of precious papers and correspondence. We have had the luxury of using the precision-made papers that Dave from Kim Bradley Creations made for us, so that we have produced an exact sized replica. And by using the acrylic templates (“Holy Peepers”) Dave also cut, we were able to fussy-cut the fabrics to produce the same effect that Frederica planned in her coverlet. The replica Frederica Josephson coverlet is now finished and will be formally presented to the National Trust of NSW at the Sydney Quilt Show on the 13 June during the Award Ceremony. Guild members Sandra Lyons, Liz Bonner and Kate Holden donated special fabrics used in the coverlet. If you have sewn a block in the coverlet or contributed in any way to the making of it, please join us at the 2012 Sydney Quilt Show at the Awards Ceremony to be recognised. We are reusing the papers that Dave from Kim Bradley Creations made so we can make another Frederica-style quilt for the National Trust of NSW to raffle at the end of this year. Jennifer Corkish and some of her students from the Southern Suburbs joined us to help cut out fabric, cover papers and sew some of the blocks together. As you can see, we managed to spread ourselves between two rooms to work on it. If you are interested in learning this English paper piecing method and contributing to the raffle quilt, come along to our sit and sew days on Friday 20th April and 18 May in the Quilters' Guild of NSW office and Saturday 7 July at the Drummoyne Community Centre. 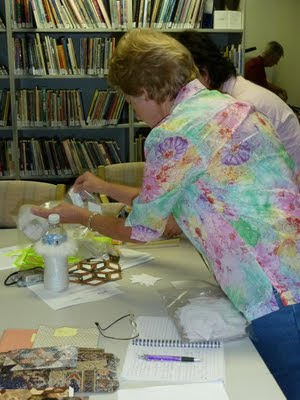 the other four were working hard - cutting out fabric and covering papers for the raffle quilt top. By the end of the day, we had only six inches left at the top of the coverlet to sew. Here is Lorna sewing the last stitches on one side of the coverlet. Please join us in the Quilters' Guild of NSW Inc. office on Friday the 17th February for our next sewing day. If you are in the city on the day, come in and look at the completed replica coverlet. If you can stay, we would love your help with cutting and sewing the blocks for the replica raffle quilt for the National Trust of NSW. We met at the Drummoyne Community Centre today to baste the completed coverlet to the backing, a quilters muslin bought from Hancock's of Paducah a few years ago which matches the original backing Frederica used. The replica coverlet looks wonderful now and we have stabilised 2 corners by oversewing the edges of the top to backing as Frederica Josephson did. In 2012 we will continue to join the top to the backing fabric and work on the raffle quilt at the Quilters' Guild of NSW Inc. office. Once again, we thank the generous donations of money, notions and fabrics from our sponsors - Kim Bradley Creations, The Quilters' Guild of NSW, Quiltsmith, Jennifer Corkish, Sandra Lyons, Liz Bonner and Kate Holden. 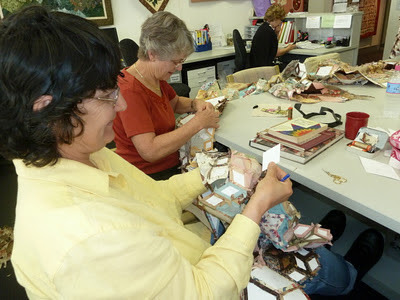 Please join us if you can in 2012 in the Guild Office to work on the coverlets. We have confirmed dates of Friday 20th January and Friday 17th February 2012 and tentatively booked dates of April 20th and Mary 18th. March, June and July dates are being confirmed in early 2012. In the meantime, others started work on cutting and bagging the fabrics for another copy of the quilt that we are making for the National Trust of NSW to raffle next year to raise funds for textile conservation. 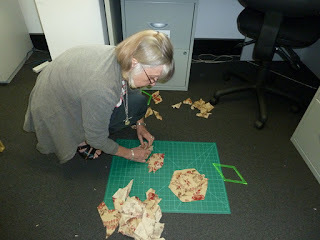 Here is Jan working on the floor (her preferred way) fussy cutting the fabric for the diamonds in the centre blocks by using the 'Holy Peepers' donated by Kim Bradley Creations. 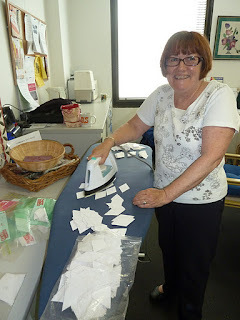 While Heather ironed the papers from the coverlet to re-use for the raffle quilt. She assured us she enjoyed this task! Please join us if you can on Saturday 3rd of December when we will baste the coverlet top to the backing at the Drummoyne Community Centre. See the details on the right in the Calendar of Events. We were visited today by Jennifer Palmer and Amelia Freelander from the National Trust of NSW who were excited to see the progress we have made on the coverlet. Jennifer said they plan to put our replica coverlet on public display at Old Government House in Parramatta for four months after we officially hand it to the Trust. It will also be displayed at the 2012 Sydney Quilt Show. Amelia, Karen Fail and Jennifer looking at the coverlet in Annette Gero's book. And some more photos taken by Karen Fail, as we laid out the completed rows of blocks and compared our work to an image of the original coverlet. At the November sewing day, we should finish the coverlet top and start cutting out fabrics for the raffle quilt we have promised the National Trust so please join us if you can. Please join us in the Quilter's Guild of NSW Inc. office for the next sit and sew on the Friday the 21st October. 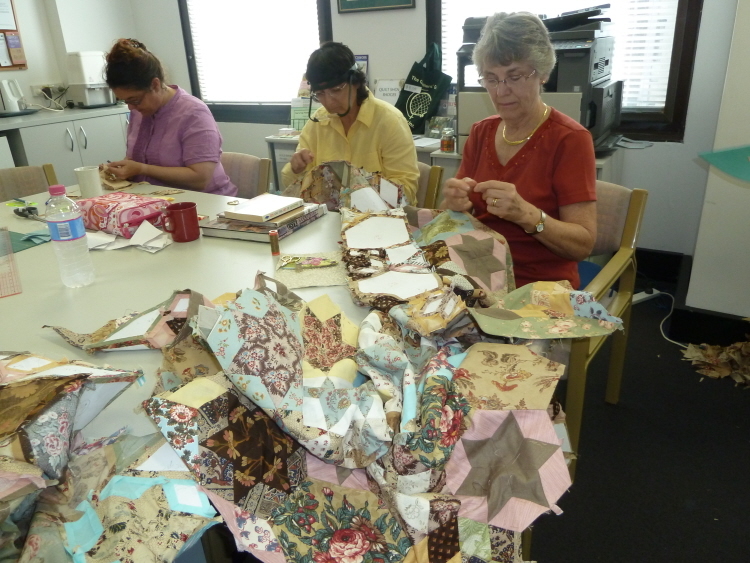 Eight quilters spent an enjoyable day in the Quilter's Guild of NSW Inc. office joining up some of the blocks into diagonal runs. Here are some photos showing how we assembled a row, working on the blocks and rows, and the result of a good day's work. The coverlet is really looking great, now we can join the blocks up. If you have not returned your blocks to the Guild yet, please try to complete and return them to us in time to use them on our next sewing day, Friday the 16th September. Please join us - all are welcome. Friday 22nd July 2011 Update. Thursday 30th June 2011 Update. There were a dozen people in the Guild Office yesterday working hard to cut out as much as possible of the fabric for our replica coverlet. We are still hunting 3 major fabrics but by our next workday in July, we should have sourced them all. We still had some fussy cutting to do, as well as cutting the strips of plain yellow fabric. Some of the helpers also covered some of the papers with the yellow fabric. Here are some photos of them hard at work. We managed to bag up quite a few blocks for sending out to volunteers to make up at home. The major blocks in the centre have now been completed so at our next meeting, we should be able to show how the centre of our replica coverlet looks. If you would like to complete a block too, please contact Karen Fail at the Quilt Study Group, care of the Quilters' Guild of NSW office. Friday 20th May 2011 Update. We only had 7 people working on the project today - we hope others were occupied working hard on their quilt entries for the June Quilt Show! But we still managed to cut out some of the centre blocks that required 'fussy cutting' using the 'Holy Peepers'. We are gathering more fabrics but are still searching for the 3 major fabrics - dark brown with blue squares, floral with light blue or green picotage or wavey background, and the mint floral with caramel bits (please see the photographs below to identify them). If anyone can help with the fabric hunt, please contact us via the Guild Office. We would also encourage everyone to come along to join us on the one day in the month when we are at the Guild Office. Please let Sandra Lyons know if you want to take part - leave her a message at the Guild Office and she will email with the details for the next work day. And when we are in the office, please drop in and take away a bag containing the papers and precut fabrics for a block, especially if you work in the city. All quilters are welcome, regardless of age or quilt experience - even if you can only cover the papers with fabric pieces you will help us complete the coverlet in time. Thursday 21st April 2011 – first ‘Sit and Sew’ day at the Guild. 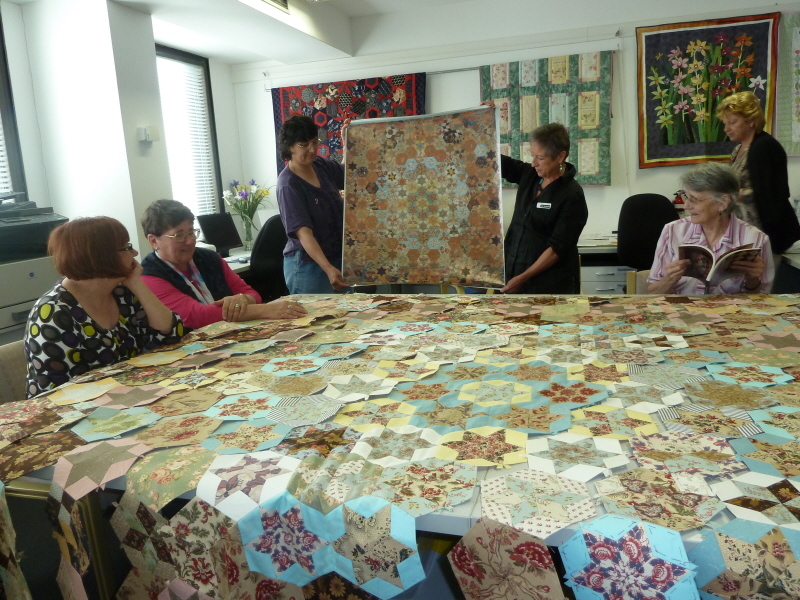 There were 20 volunteers at the NSW Quilters’ Guild office in the Sydney CBD who came together to start work on the copy of Frederica’s quilt for the NSW National Trust. Sandra Lyons explained the project to the volunteers by looking at the poster copy of the quilt and examining the fabrics Frederica used. 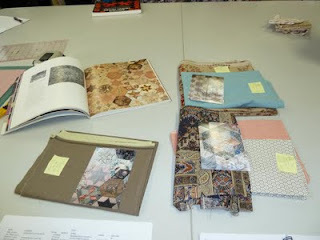 The group decided which fabrics to use in each block, and arranged each fabric with the photograph of the associated block from the original quilt, ready for cutting. After Sandra gave a short demonstration on how to piece over the papers that Kim Bradley Creations had kindly donated, the volunteers set to work in strip cutting the fabric for the centre blocks, fussy cutting the fancy fabrics using the 'Holy Peepers', writing the piecing instructions and bagging the the blocks up, ready for sewing. 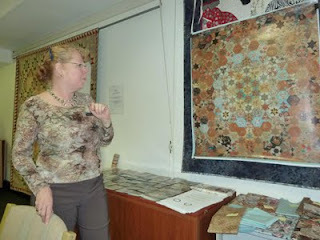 The next Sit and Sew in May will continue the work and concentrate on completing the centre of the quilt. 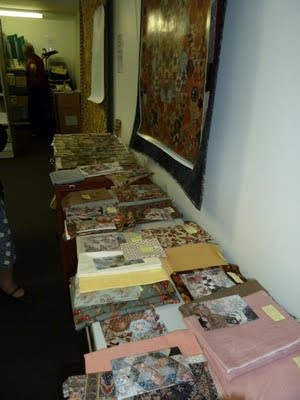 In October 2009, the Sydney Quilt Study Group (as we were then) arranged a visit to the National Trust of NSW property, Old Government House at Parramatta. We were given a guided tour of the property by the National Trust's Soft Furnishings Project volunteers and saw in detail how they had reproduced items such as braid, curtain tiebacks, floor rugs and curtains for the property. However, we saw no quilts in the building (there had been a display of quilts there curated by Annette Gero in 2000) due to the fragile nature of their textiles. 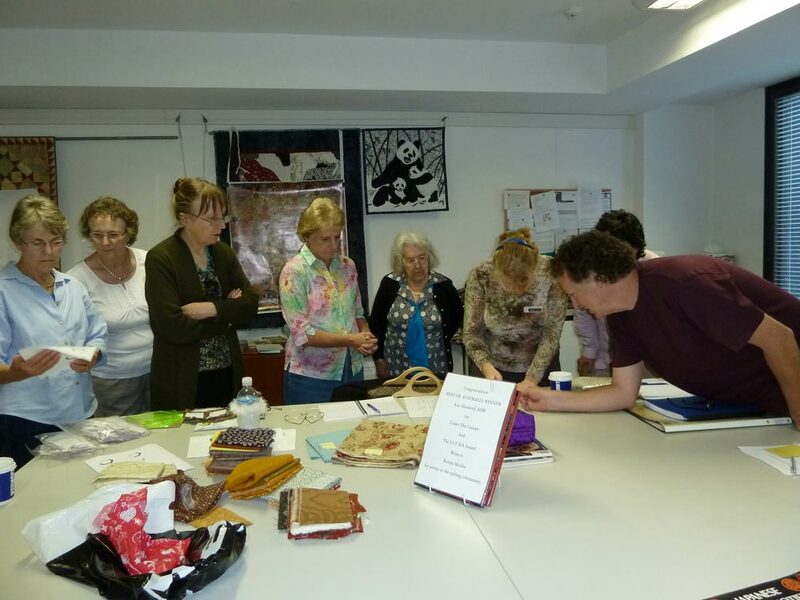 After talking to the volunteers, our committee decided that we would approach the NSW National Trust to suggest we create a replica for them of one of their precious quilts that could be put on display in a National Trust property. After much discussion we decided that the Frederica Josephson quilt would be the most appropriate of the quilts in their possession to replicate and after contacting the National Trust's curator, Jennifer Palmer, in 2010 to see if this project would be acceptable to them, we were happy to get the go ahead. 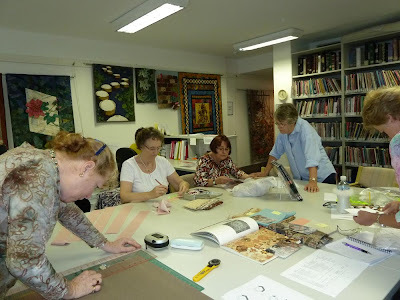 In the meantime, the Sydney Quilt Study Group had been unincorporated and we had become the QSG of NSW, a sub-committee of the Quilters' Guild of NSW Inc. In early 2011 we were delighted to receive a $500 budget from the Guild to cover the purchase of fabrics and templates. In mid January 2011 Karen Fail, Annette Gero, Sandra Lyons, and Maree Gebhardt (President of the Quilters' Guild of NSW Inc) viewed the quilt at Observatory Hill. After that initial viewing we arranged to take extensive photographs of the quilt so the exact copy could be planned. This was done by Karen Fail, Sandra Lyons, Liz Bonner and Jennifer Corkish on the 14th March. Jennifer Corkish, Karen Fail and Sandra Lyons examining the Frederica Josephson quilt. In early March 2011, we contacted Kim Bradley Creations (http://kimbradleycreations.com/) to see if they could assist by cutting the papers we needed to exactly the same size Frederica used. Since we wanted to use the same method (piecing fussy-cut fabrics over papers) we needed the correct and best tools. When they learnt of our proposed use for the papers and the non-standard size of the blocks, Dave at Kim Bradley Creations, kindly offered to make the 'Holy Peepers' acrylic templates and all the papers we needed for free. This donation was worth several hundreds of dollars and allowed us to fussy cut the fabrics and make rapid progress in putting the blocks together. We visited Quiltsmith in Annandale, NSW on the 25th of March to start our search for fabrics we could use in making our copy. While we were there, Melinda kindly donated $200 towards the purchase of our fabrics. You can see some of our 5 hour marathon effort at matching colours and fabrics on the Quiltsmith blog - http://quiltsmith--australia.blogspot.com/. Other fabrics were purchased as needed and some of those people working on the project donated special fabrics from their own fabric stashes. Jennifer Corkish also donated some Aurifil threads to use to sew the blocks together. In the meantime, Karen Fail has assembled a list of volunteers from the Quilters' Guild of NSW Inc to work on the quilt in the Guild office. The first sit and sew meeting will take place in April 2011 and further updates on the progress of the quilt will be documented on this page. Click on the image below to be taken to the photographs of the quilt we took - they will appear in a Picasa web album. If you know where we can source these fabrics to help us make an exact replica using original or reproduction fabrics please contact us at the Guild office.